Attendees met at President Garfield's monument at Lakeview Cemetery at 10am to begin the walking tour. We were guided through some of the best and most interesting monuments in the cemetery, and instructed in the various symbols and meanings of the different styles of monuments. Our tour included the interiors of the Garfield Monument as well as Wade Chapel, which is decorated with a fabulous Tiffany glass mosaic. The group then made their way to Nighttown Jazz Club, where they were welcomed by our RC Pat Fernberg, who delivered an opening that encapsulated the spirit of the event. Carrie Bebris entertained the group with stories of killing off her characters (she liked killing Henry Crawford so much that she did it twice!) 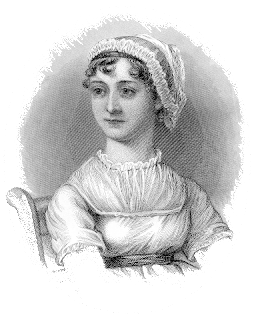 and read the local essay contest winner's obituary of Mrs Bennet, (available here) to the delight of us all. Tim Bullamore opened the speakers' portion of the event with a thorough, informative, and enthusiastically delivered talk on obituaries in the time of Jane Austen. We learned about royals, criminals, authors, and the obituaries they received. Juliette Wells followed with a presentation on how we imagine Austen. She showed pictures of various interpretations of Austen's appearance, including Cassandra's sketch, but the general consensus in the room was that we imagine Austen according to our own relationship with her as an author. The event closed, as the best events do, with cake and shopping. The Emporium was graced by the presence of Pittsburgh's Bohemian Belle historical costume shop, as well as a large display by locally owned Jane Austen Books. Tim Bullamore also set up shop in the corner to show off his fabulous Jane Austen's Regency World Magazine. The day was a great day for Austen fans in Cleveland, and we hope to repeat it often!